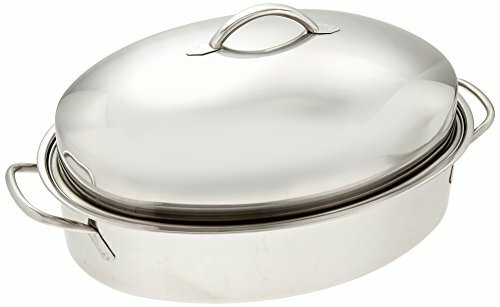 ExcelSteel Professional Stainless Steel Dome Roaster W/ Roasting Rack, 18.75" x 12.25" x 8"
An essential piece of cookware for family dinners, parties, and holiday celebrations. The dome shaped, quality Stainless steel roaster with roasting rack is designed to hold fish, chicken, or any type of roast. Riveted Stainless steel handles make placing the roaster into the oven and lifting it out, safe and easy. Measures at 18.5" x 12.5" x 7.5". An essential piece of cookware for family dinners, parties, and holiday celebrations. The dome shaped, quality Stainless steel roaster with roasting rack is designed to hold fish, chicken, or any type of roast. Riveted Stainless steel handles make placing the roaster into the oven and lifting it out, safe and easy. Measures at 18.5" x 12.5" x 7.5".